Ukrainian film director, political prisoner in Russia Oleh Sentsov has won an award of the international prize in the field of investigative journalism and the protection of human rights in the world named after Sergei Magnitsky, Radio Liberty has reported. As noted, the award ceremony was held in London (United Kingdom) on November 15. It is noted that the Magnitsky award ceremony has been annually held since 2015. 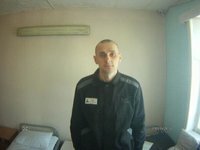 Earlier it was reported that on October 25, Sentsov became the winner of the Sakharov prize of the European Parliament for Freedom of Thought.